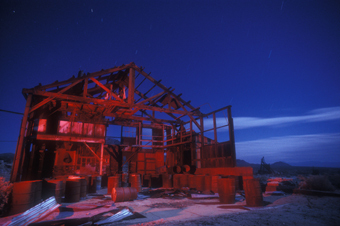 Canadian night photographer, Larrie Thomson, and I circled the back roads in the “Barstow, Mojave, Ridgecrest triangle.” We jabbered and joked over walkie-talkies as we crisscrossed the high desert, driving nose to tail, searching out locations for that night’s photo-shoot. It was getting near dark and we had yet to find the right creepy spot to set up the cameras and make our full moon time-exposures. We rolled north on 395. As we cruised into Red Mountain, the eastern shoulder of the highway sloped away to a series of ramshackle buildings barely visible from the road. An abandoned mine complex: we’d hit a photographic motherload! Spinning a quick U, we hid our vehicles across the highway behind the tall creosote bushes. As the sun went down we gathered our gear and pretended not to see the “No Trespassing” signs while squeezing through the rusty barbed-wire fence. 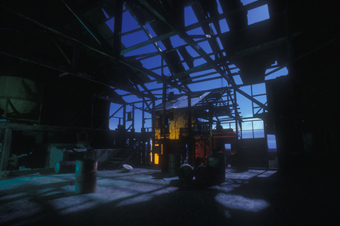 The Atolia Tungsten Mine was established in 1905. By 1916 it was a full-fledged town boasting a modern school, four restaurants and even a newspaper. Between 1916 and 1918 it produced $10 million in ore. By World War II the mines had played out and the town folded up and blew away in the endless Mojave wind. Today the site contains about a dozen buildings, all in various states of disrepair. Some largely intact, others tattered and partially collapsed. Anything of value is long gone. “The Acid House” reeked of toxic chemicals spilled everywhere. Sinks and spray booths scorched with chemical burns, I couldn’t spend much time in there, my sinuses instantly burned and I felt my DNA begin to unscrew. Nice place to hide a body. Or dissolve one. Around midnight, a bitterly cold late-winter storm blew through. Clouds bled ominously across the sky as the storm passed. The moon ducked behind the clouds pushing exposure times to the 20-minute mark. Even my Canadian companion got cold. Used to low-desert shooting at night in shorts and t-shirt and typically unprepared, I had to borrow an embarrassingly dorky stocking cap from the artic-explorer Larrie.